The artist known as Nicolina with one of her creations for the 13 Portals project. Looking for an opportunity to take a family trip, Rick’s niece Nicolina became one of our inspirations. Having moved to New York about 10 years ago, Nicolina has lived the life of a struggling artist in one of the world’s cultural and artistic capitals. To get by the first year, she worked at several restaurants, a talent agency, and at handful of other odd jobs. Then she decided to only do work related to her passion: Art. Soon she built up a business as a children’s face painter and a storefront window painter, learning the value of a strong work ethic, pursuing what she loves, and building relationships with her clientele. Connections led her to increased work, meeting kindred spirits, and a variety of opportunities to let her creative light shine. Now well established in the Big Apple, Nicolina has taken her art and her vision across the world to places like China, Japan, Vienna, Rio de Janeiro, Chile, Mexico, Haiti, and Cuba. While she nourishes her creative soul with mammoth installation, like painting the iconic funiculars of Valparaiso in Chile or creating a floating art gallery atop the canvas covers of 75 boats in a Rio de Janeiro’s Urca Harbor, she’s also motivated to instill a love of art and free expression in the children she encounters on her journeys. 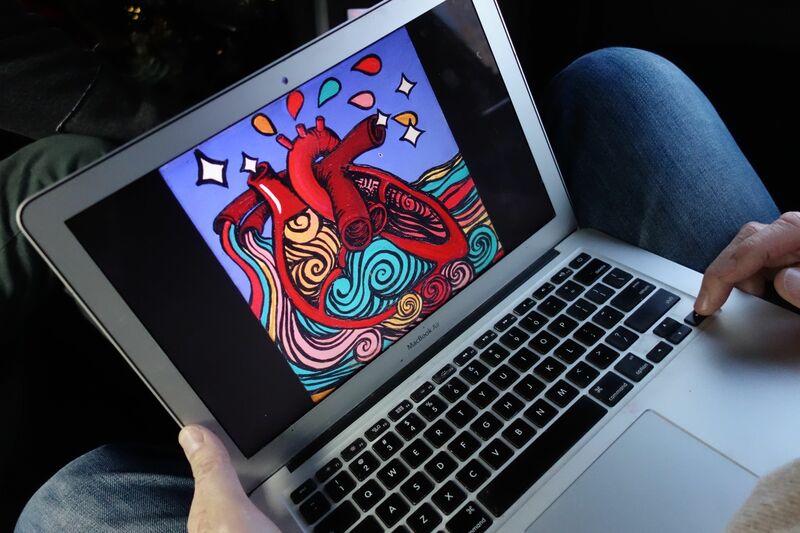 She teaches them to draw what they feel and “see” in their hearts in a stylized graphic of an anatomical heart, her signature logo for her project Hearts of the World. Every version of the stylized anatomical heart always expresses the same theme: whatever brings you love and passion for life. Few in the family have ever seen her work in situ, only ever glimpsing digital photo images of the colorful and dramatic creations. So, as much as this trip to New York was about getting to enjoy a family vacation, it was equally important that we finally get to see Nicolina’s artistic fingerprints that decorate her adopted hometown. 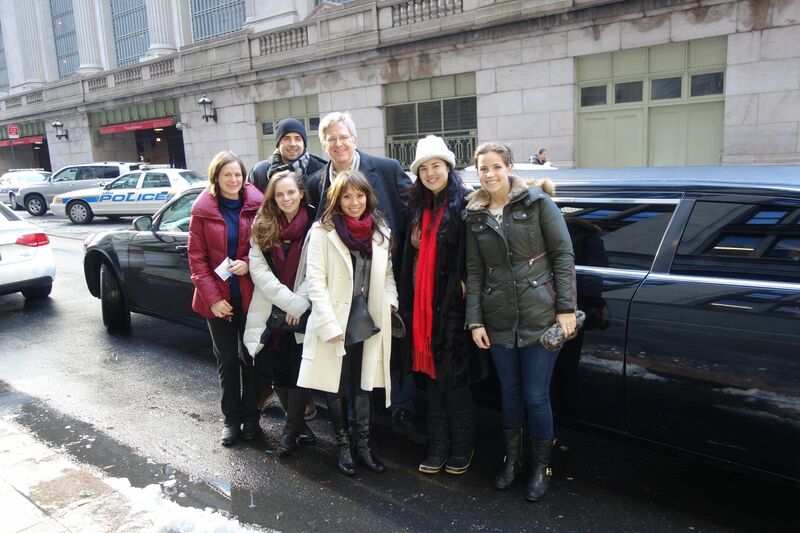 With seven of us, it’s nice and cost-effective to tour New York and Nicolina’s art in style. 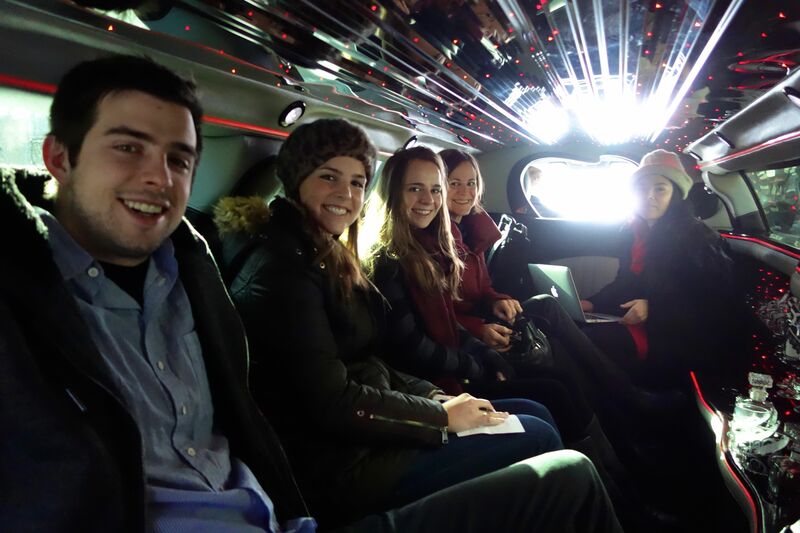 For convenience, (and admitted luxury at a reasonable price for seven people), we arranged for a limousine to take all seven of us (Andy, Jackie, Linda, Caleigh, Nicolina, Rick, and me) on a tour through New York, with Nicolina as navigator and tour guide. As we headed to each new location, she shared anecdotes to set the scene and to give context to the art we would be viewing. While the specifics now elude me, I remember thinking how bold, innovative, resourceful and talented this thirty-something is. 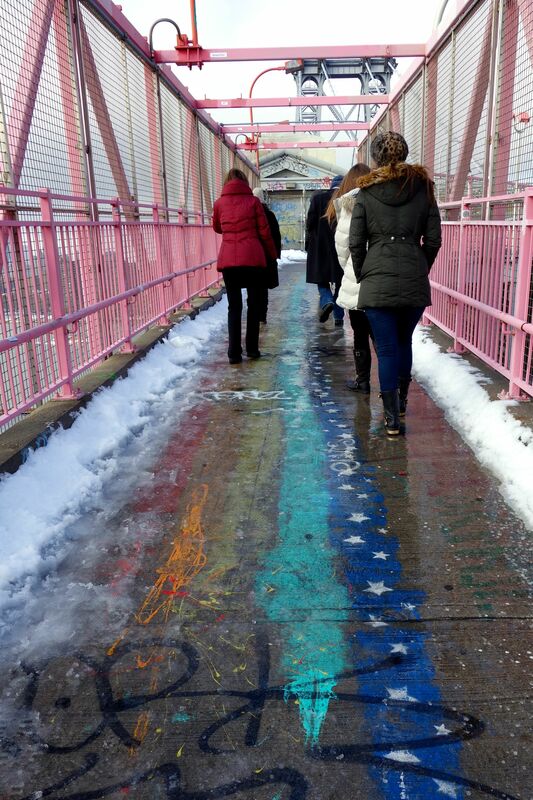 Why just walk on a bridge when you can traverse the boroughs on a rainbow? 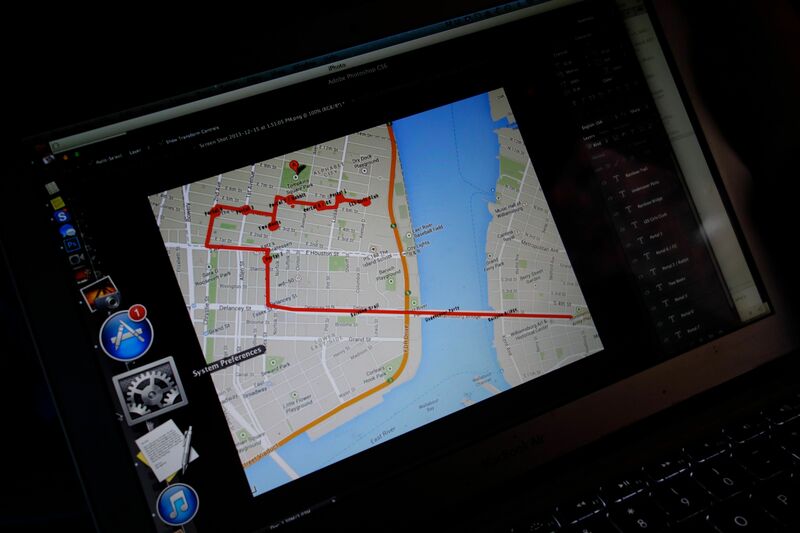 The first location took us across the Hudson, into Brooklyn. 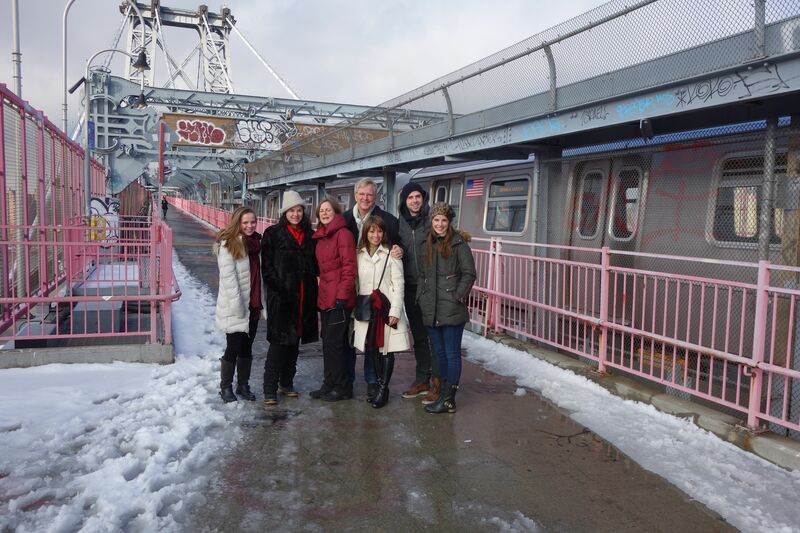 We followed her up the pedestrian ramp of the Williamsburg Bridge. Within a few meters, we were suddenly walking on the faded remnants of a rainbow, created several years ago; a rainbow that led to one of Nicolina’s colorful anatomical hearts. While she is the one who conjures the artistic vision, she often enlists the support of friends (artists and civilians alike) to create her “flash art”. Weeks prior to this bridge art creation, she and her crew practiced on a friend’s rooftop, coordinating materials and tools, designating who would paint what, and working to complete the graffiti art as quickly as possible. You can see the tower behind us, atop which those-who-shall-remain-nameless have celebrated. When it came time for the real deal, with scouts looking out for cops, a slew of art partners-in-crime invaded the bridge and within mere minutes had created literal street art. In tandem with its debut, Nicolina and friends organized a treasure hunt of sorts, with the prize being an exclusive party at the top of the bridge–not on the bridge, but in one of the towers that supports the bridge. We’ll not discuss the legality of that. 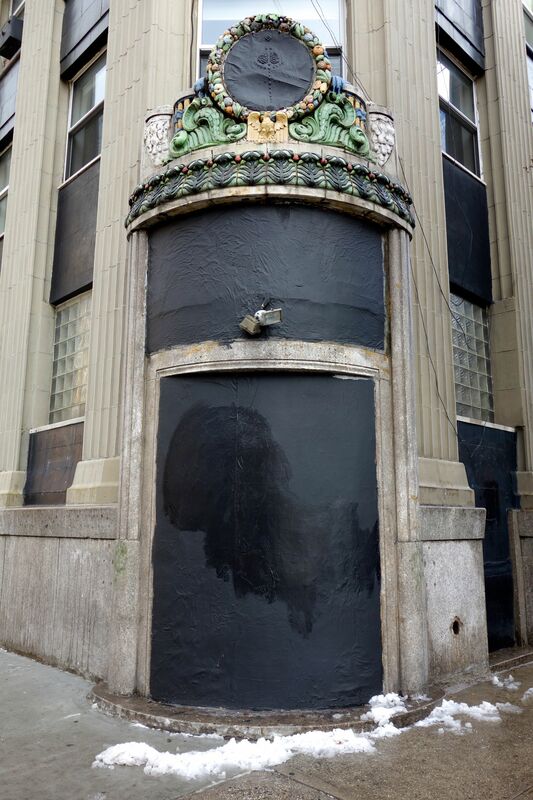 What was once an elaborate and exotic “portal” is now a lifeless eyesore. 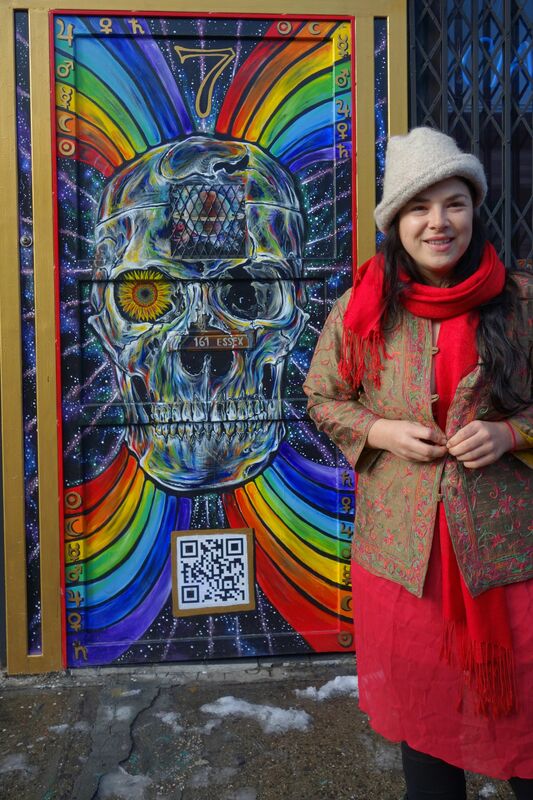 The brainchild of Nicolina and Brazilian artist Pérola M. Bonfanti, the recent 13 Portals project involved an artistic scavenger hunt through New York’s East Village, with each portal embedded with a QR code revealing where the next portal would be. We visited a few on the tour, but sadly, others had been vandalized, tagged, or purposefully covered by property owners. While we all expressed sadness and pity for her at losing her creations, Nicolina took it all in stride and reminded us that art is ephemeral. Whether it last for centuries or for a mere twinkle of an eye, art–like life–is meant to be enjoyed in the moment. With all the creative ideas in Nicolina’s head, she could work every day of the year and still need more time to finish all the projects she envisions. But she knows that artistry must be balanced with practically, especially when it comes to paying bills. Her bread-and-butter is painting storefront windows. From bo-bo (bourgeois-bohemian) coffee shops to funky pizzerias, she has made her presence known all over the city. Two Boots commissioned this groovy piece for their Grand Central Terminal pizzeria. Can you spot one of Nicolina’s stylized anatomical hearts? Most notably, you and thousands and thousands of other travelers can see her creations at Two Boots Pizzeria‘s Grand Central Terminal location. 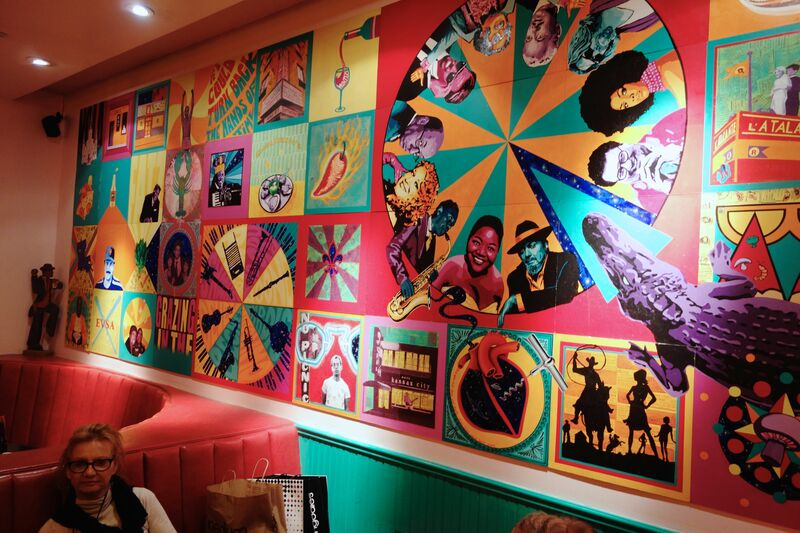 Bold colors, famous faces, silhouetted graphics, and, of course, her signature anatomical heart are on full display, providing a feast for the eyes as you feast on the eatery’s pizza. Nicolina creates a world of possibilities at the Lower East Side Girls’ Club. But one of my favorite pieces was her project at the Lower East Side Girls’ Club. 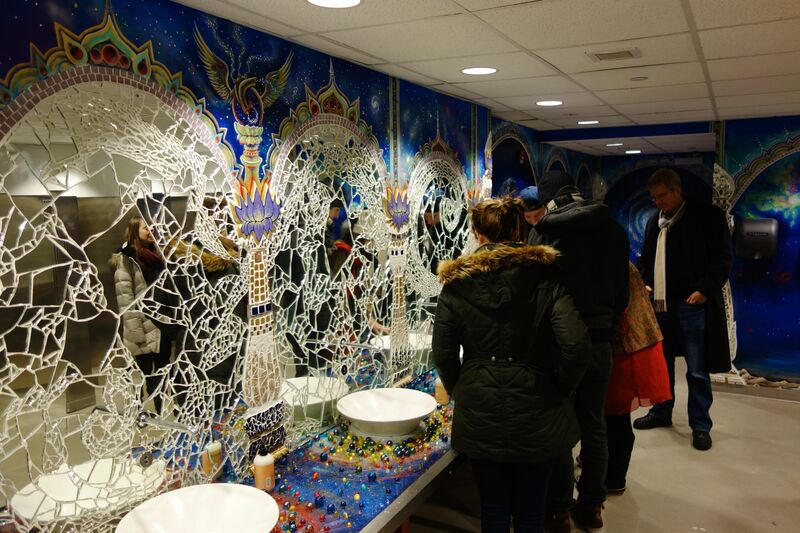 In one of the girls’ restrooms, Nicolina transformed a stark, clinical space into a universe of beauty. With walls saturated in celestial blues, an entire cosmos of ethereal planets, a crackly mosaic of mirrored glass, and a Milky Way of marbles (or miniature planets) embedded into the counter tops, this installation spoke volumes to me. This is more than a decorative bathroom; this is a safe space that, with subtle brilliance, reminds the girls that no matter our faults or the cracks we think we see in our own reflection, there is a world full of infinite beauty, and we are all a part of it…and it is a part of all of us. It’s one of the most poignant messages that Nicolina conveys through all her works. One project, one space, and one idea at a time, she provides visual reminders to all who open their eyes and mind to it that beauty is everywhere and that it is in everyone. It manifests not only in the physical but also in our creativity, in our tenacity, in our kindness, in our cooperation with others, and in our ability to appreciate life in the moment. And I, for one, am thankful that Nicolina is leaving her mark on New York for everyone to see. 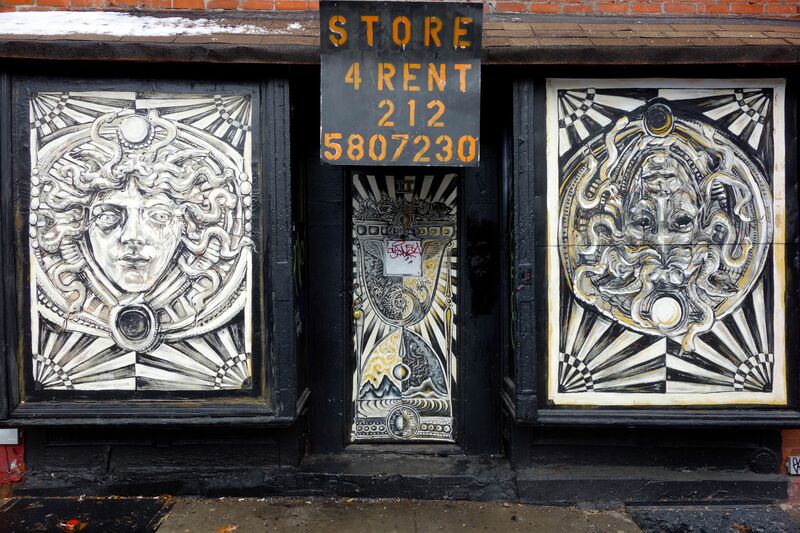 Thank you, Nikki, for showing us New York through your artist’s eyes. Thanks for collecting all these good thoughts on a very inspirational day. Everyone gets to decide what they’ll do with their life…or not. And in that regard, Nicolina is certainly in the driver’s seat.